Motherwell ace Carl McHugh reckons it is vital that the fans back the team as the Steelmen battle to retain their Scottish Premiership status. 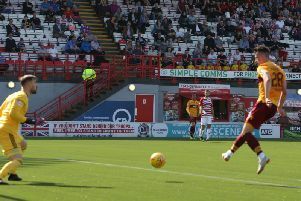 A section of Fir Park fans voiced their displeasure at Saturday’s poor defensive display in the 3-2 home defeat against Dundee, with goalkeeper Craig Samson singled out for his error at Dundee’s opening goal. Ex-Plymouth Argyle star McHugh, speaking after a defeat which leaves Motherwell in the second bottom relegation play-off spot with just four matches remaining, said: “Things happen in games and people make mistakes. Sammy has saved us plenty of times this season though and you can understand the frustration from the supporters. Midfielder McHugh, who has played in ’Well’s defence in recent weeks due to an injury crisis, admits he and his team-mates are under pressure to keep Motherwell up and preserve the club’s impressive 32-year stay in the top flight. It’s only two years since the Steelmen only stayed in the Scottish Premiership thanks to a nerve shredding 6-1 aggregate victory over Rangers in the play-off final and McHugh is desperate to avoid such a scenario again. He said: “I think you’ve always got nerves because everyone knows it’s important. “You have to embrace it because it’s a challenge and an opportunity for you to grow as a player and a person. “It’s a tough situation but there’s nerves every game you play. The importance grows each week but I think we have the players to deal with it. “We want to get out of the play-off position. If Motherwell are to finish third bottom or higher this season, they’ll surely need an improvement in their luck. Saturday’s defeat against Dundee saw a Ben Heneghan header which clearly crossed the Dundee line not given as a goal, the third time this season that ’Well have been on the wrong end of such a call.